The week before New Years, I spent my evenings snuggled next to our Christmas tree, sipping the BEST homemade hot chocolate and reflecting on 2014. The coziness of the tree and warm mug brought out my reflective side. I thought about the good, the bad, and the “What-in-the-world-was-I-thinking?” moments. With 2014 penned in my teal polka dot notebook, I planned for 2015. I’m not a huge planner when it comes to a new year. I have learned after many years of disappointment that it’s best to create a small list of doable actions each year versus plan an entire 12 months with lofty, unachievable goals. Actions become habits, and calculated habits (the good kind of habits) create amazing lifestyle changes. One of my actions for 2015 is to bring you more videos. Hip-hip-hooray! My desire in making videos this year is to bring you a visual guide for how to make DIYs, recipes, and more. Personally, I learn best when I see something in action, and I believe many of you are the exact same way. So, today, as part of my 2015 action plan, I’m bringing you a new video for one of my favorite DIY recipes here at Live Simply: Homemade Vapor Rub (find the original recipe post here). 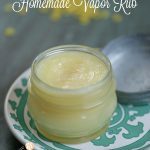 Vapor rub is one of the easiest DIYs you can make at home, but the ease of this recipe isn’t always communicated via a written blogpost. It’s easy to read through a list of written instructions and feel completely and utterly overwhelmed. As the video demonstrates, homemade vapor rub is anything but overwhelming. My homemade vapor rub recipe also requires very few ingredients. Each pronounceable ingredient comes together to create an effective homemade remedy for winter sniffles or an afternoon headache (Seriously, give it a try!). homemade vapor rub is anything but overwhelming. My homemade vapor rub recipe also requires very few ingredients. Each pronounceable ingredient comes together to create an effective homemade remedy for winter sniffles or an afternoon headache (Seriously, give it a try!). In a saucepan*, over low heat, add the coconut oil and cocoa butter. Melt. Remove the pan from the heat. Allow the mixture to cool for 5 minutes. *I used a double-broiler in the video. You can learn more about a double-broiler and my DIY essentials, here. Homemade vapor rub will keep at room temperature for 12 months. I purchase a bulk-size bag of beeswax from Mountain Rose Herb. I’ve also purchased beeswax pellets on Amazon (smaller bags), and enjoyed the product. A local beekeeper in our area just started selling beeswax bars, so if you have connections with a beekeeper in your area, ask about purchasing beeswax. Hi Kristin! Thank you so much for your wonderful blog! I’ve made several DIY’s from your blog and get great results! My little one got a cold so I’ve been using this vapor rub and your elderberry syrup recipe. I had trouble getting him to take the syrup so I added it to homemade ice pops and he gobbled it right up. Thanks again! I really enjoy your blog! 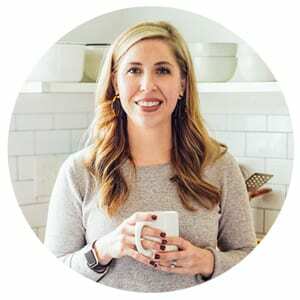 Hey Jennifer, I’m so happy to hear that you’ve made and enjoyed many of the DIY recipes. What a great idea to make homemade ice pops with the elderberry syrup!! I bet the ice pop and elderberry syrup combo was very soothing for your little one. Thank you for sharing…I’m going to make some tonight! Hi Kristin! I have a quick question: I am allergic to beeswax. Is it possible to substitute candelilla wax? If so, in what proportion? Thanks! Hey Kirsten, I haven’t tried candelilla wax before, but I found this article by one of Live Simply’s contributors: http://www.humblebeeandme.com/quick-guide-candelilla-wax-liquid-oil-ratios/. It looks like it will work, but I’m not sure of the exact ratio. If you try it, let me know! Hi Kristin! This homemade vapor rub sounds awesome! I would like to know if I can substitute cocoa butter for other type of butter (like shea butter). I don’t find cocoa butter that easily where I live. Many thanks! Hey Rosario, I think shea butter is a perfect substitute for the cocoa butter. Enjoy!! Hi. I was looking at this recipe and your other one for vapor rub and notice the ingredients and directions are the exact same for both of them, yet in the pictures, the consistency of the vapor rubs look different. One looks rather solid while the other looks more like vaseline does. Was there a misprint in the recipe and there is supposed to be a difference, or did your batch just end up different both times because of something like weather/temperature that day? Hey Christine, They are the same recipe and consistency. The lighting is just different which gives the new pictures (which features a video tutorial) a bit more of a Vaseline look. Just a different angle of lighting :).